The capital of Cantabria, Santander, entices with its Belle Époque historic quarter, El Sardinero. From here the Cantabric Sea is on full view from the La Magdalena peninsula. While very little remained of the historic Cantabria due to the ravages of the Great Fire of 1941, there is plenty to see on your Santander motorhome rental in Spain if you are into natural parks, and plenty to dig your fork into if you love sea food. The fire may have wiped out the medieval town centre and gutted its Romanesque cathedral, but it did not affect Santander’s standing on the pilgrim’s road to Santiago de Compostela. 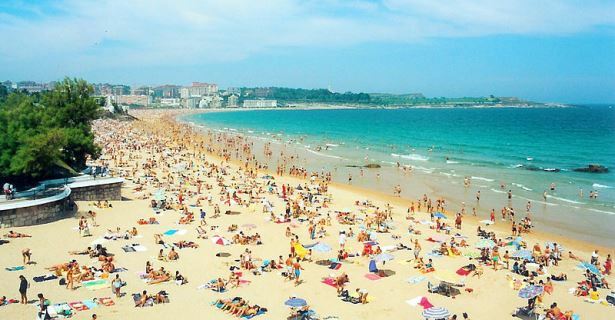 As a regular port of call for cruise ships, Santander is a short ferry ride away from Brittany (France) and a longer ride from Plymouth (England), so it makes for a convenient last stop on your tour of northwest Spin if you want to throw in cruising in between. While you’re here, take a chance to peek into the caves of Altamira just half an hour away by campervan hire or RV rentals. The region is full of them, but Altamira’s, a UNESCO World Heritage Site, offers a step back into pre-history (about 25,000 years ago to be exact) with its rudimentary rendition of bison and deer in red paint. If the caves are not open (to mitigate carbon dioxide emissions from tourists), other caves are available for spelunking opportunities. Cantabria’s capital is well-positioned to put travelers by Santander motorhome rental on the road to Basque Country to its east and the beyond-the-tourist-radar Asturias to its west. If you come in early summer, you may make a dash to the Sanfermines Festival in Pamplona, two and a half hours away by RV rentals, after stopping along the gorgeous beaches of San Sebastian in Gipuzkoa. Then make a turn west to the historic region of Castile-León where the World Heritage towns of Salamanca (old city), Avila (medieval walls), and Segovia (old town and Roman aqueduct) beg for exploration. Join pilgrims who pass through the region on their way to Santiago de Compostela on the western tip of the Spanish Iberia, or linger around the Atapuerca archaeological site to see traces of the first settlers in Europe. From here, it’s easy to make the two-hour drive up to Costa Verde on your motorhome rental or campervan hire to the unspoilt beauty of Asturias. The beaches are irresistible, the lakes, valleys and mountains inviting, and so are the region’s bean stew ‘fabada’ and cabrales cheese. Pitch your Santander motorhome rental where your fancy, or appetite, takes you.